Hi friends, hope the time change has got you off to a good start. Me on the other hand, I’ve been a bit thrown off and hoping to spring back into action soon. But today, I have something special for you. 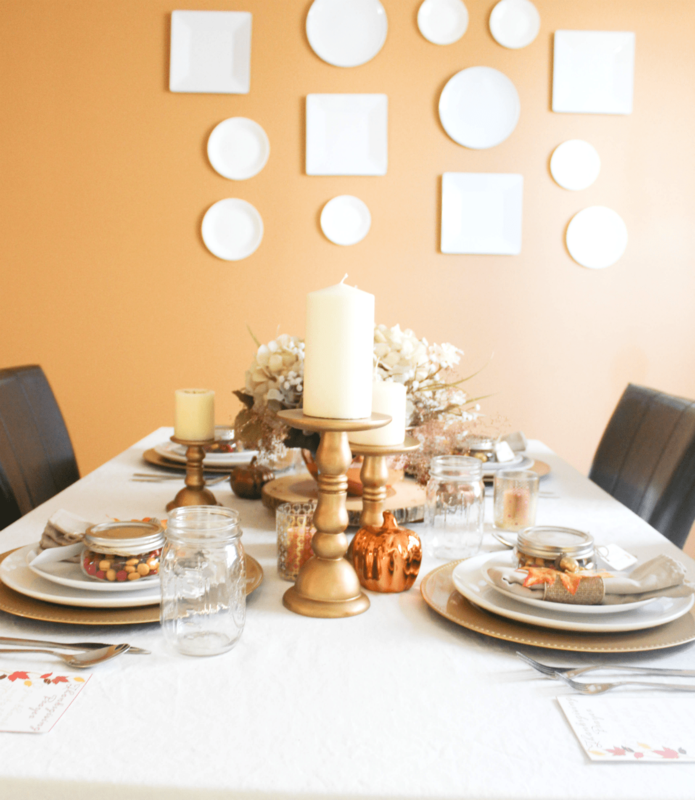 I’ve teamed up with some of the most creative women to bring you lots of Thanksgiving tablescape inspiration! Thanks to Sabrina at Meet our Life and Kelly from North Country Nest for the invitation and for putting everything together. I’m still not sure if we are hosting Thanksgiving at our home this year. But it’s a great idea to have some things ready just in case. So I decided to come up with an idea of what the ‘feel’ of our table setting might be. 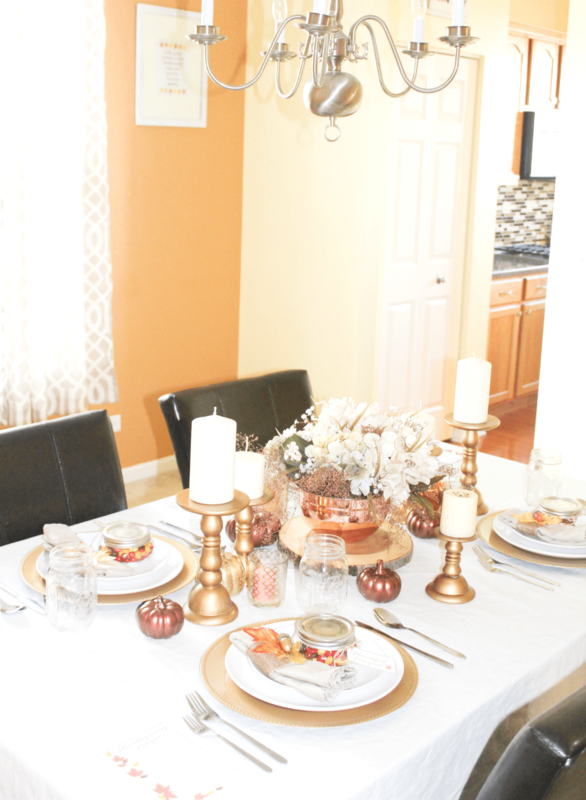 You’ve seen my Fall table setting here where I used pinecones and gathered a few things around the house to create the table soup and salad style. 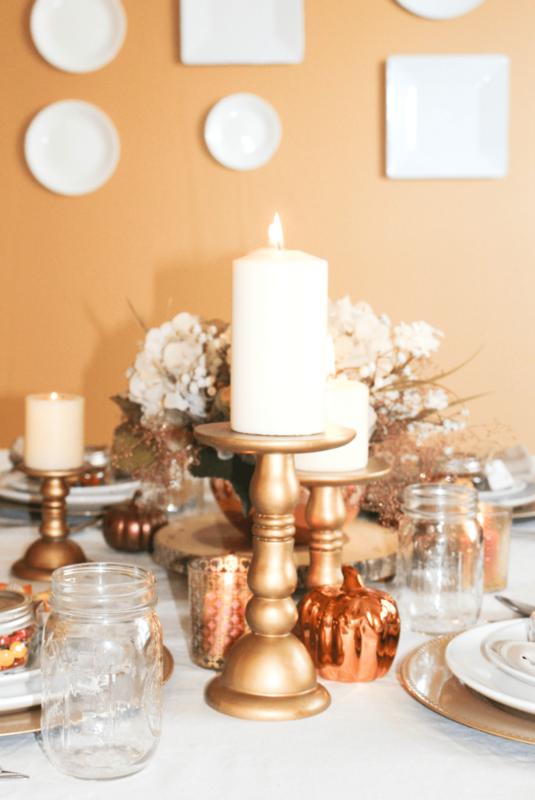 For this Thanksgiving table idea, I changed out the look and made it a bit more sophisticated with lots of candles, gold, copper, and DIY items. I’m going to try to give you a quick explanation how I created this look. I first planned the table around a copper and gold base, some items I had on hand, others I bought for a couple bucks, and others I DIY-ed. Then I covered it with a white linen tablecloth and dressed it up. I used a copper bowl I had on hand, filled it with tiny lentils, and added a mixture of faux flowers to create a centerpiece. My rustic wood charger came in handing for adding some height to this beauty. What do you think? 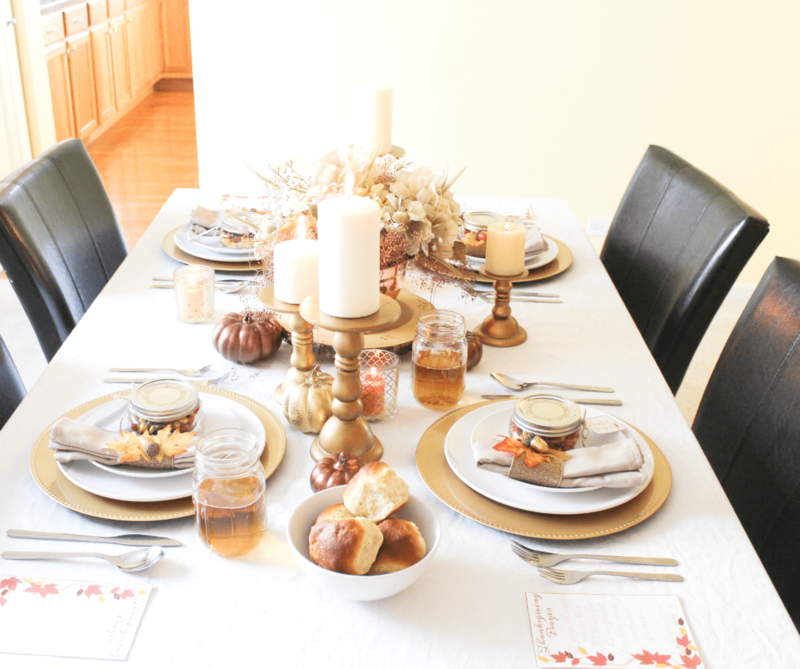 I have a thing for pedestal candles and I just really love them on a Thanksgiving table setting. I gathered some that I bought earlier this Fall for my mantle to add to the centerpiece. I also mixed in a few smaller votive candle holders from the Dollar tree. Tiny faux pumpkins were placed randomly to finish off the entire centerpiece. Vintage metallic paint was used to repaint a couple of them. Let’s talk about the dinnerware and the rest of the table. The plates, silverware, and Mason jars for drinking I already had on hand. I used golden chargers from the Dollar Tree (you all) as placemats. I was super happy they brought them back this year. In the past, I owned some of them but I think thy got misplaced or thrown away in a bundle when we moved back in the summer. The napkins got a little sprucing up with some DIY napkin rings. I used ribbon, faux fall leaves, acorns, and hot glue to whip them together. I did not put the tutorial on the blog but as you may imagine, they were super easy to do. I’m excited about these Thankful Prayer cards. It’s a good way to get family and friends to remember to be thankful for the many many many blessings that surround us. Download these 5 x 7 thanksgiving-prayer-cards for free. I was able to finally stock up on Cardstock paper a few weeks ago and I am enjoying using them to print things like these using the best printer settings. I finally decided to go against my husband’s don’t use up all the ink to print all your stuff and just do it. Ha ha.. I joked with him about it so he knows. The final DIY on the table are the gift tags. If you have extended family or friends coming over, surprise them by adding a small gift to the table. Or you can do it for your own household. They’ll appreciate it. I filled small mason jars with colorful M&Ms and tied a “Thankful for You” tag around each one. 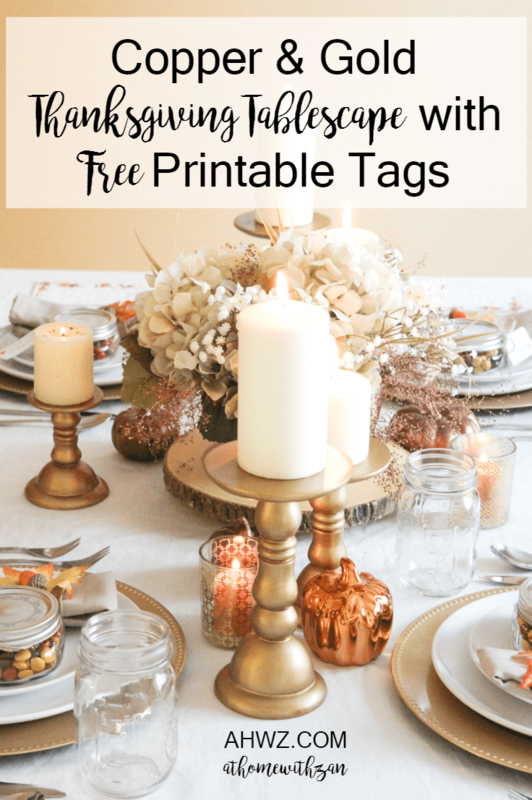 Download thankful-for-you-place-cards, print out on cardstock paper, cut and attach them to the gifts with twine or ribbon. You can also snag these other Fall printables on the wall for free, too. You’ll be able to see them up closer by clicking on the links here. Before your guests arrive, add some rolls and fill the cups with drinks so they can start off while they await for the rest of the dinner (restaurant style). Don’t forget to light the candles!! So that’s the table in a nutshell (a huge nutshell). I really love how it all came together. And I hope you enjoyed it too. We already ate on the table this past weekend. But of course, I saved the gifts for later. What do you think of the table? Are you hosting Thanksgiving this year? I would love to know your thoughts in the comments. 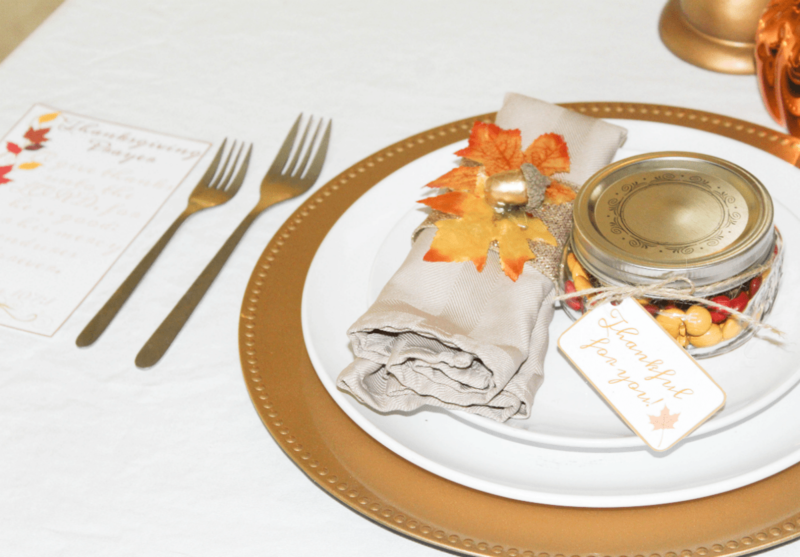 And don’t forget to check out these other Thanksgiving table setting ideas from some very creative ladies by clicking on the links below. I know you will enjoy them!! I am just loving the copper & gold! What a great idea to have the M & M’s as favor jars. Such a lovely table! I thought it the M&Ms would be a fun little surprise. I think I might just eat them all to myself:) Thanks Michelle!! I love the Thanksgiving prayer, the copper and your centerpiece. Beautiful setting! Thank you so much Amy!! I am glad I was able to put it together!! What a great way to bring both metallics together. I am really loving the addition of copper in home decor, aren’t you? Your printable tags are the icing on the cake. At first, I was not sure how gold and copper would work together but I’m glad I tried it. Glad you enjoyed the tour and thanks for the lovely compliment!! Swooning over all the gold! Your table is gorgeous! Love all the copper bling! It is fun blog hoppin’ with you this week! It was so fun to do this! And I love all the copper too!! Yes, we’d love to have you!! Thanks!!! 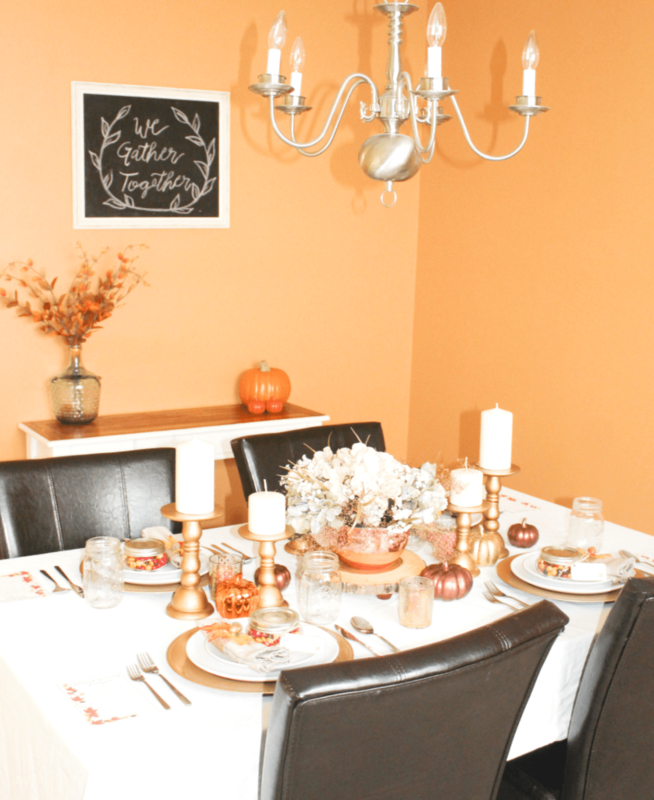 What a pretty copper themed tablescape for Thanksgiving. I like candles on pedestals too! 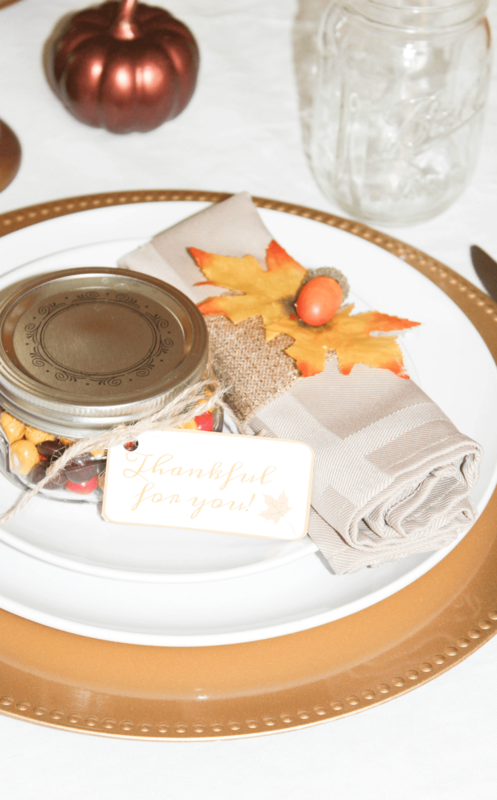 I like the idea of your printed Thanksgiving prayer and the little mason jar favors! I am enjoying all of the tablescapes in the hop, it has been nice to be a part of this great group of bloggers! It really was a nice hop and such a fun group. Thanks and I had fun putting the table together!! 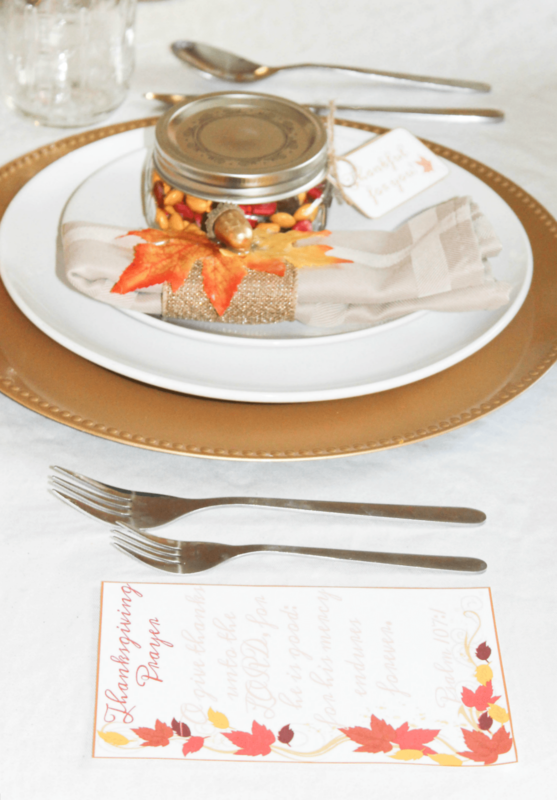 What a beautiful tablescape Zan, I especially love the thanksgiving printables. What a great personal touch!! I hope you and your family will have a wonderful holiday season!! Thank you Sabrina and thanks for the hop invite. Hope you have a wonderful Thanksgiving with your family, too! love the gold and copper!! Thank you so much Madi!! This is beautiful! I love the copper and gold, especially the centerpiece! Thank you for joining us on this blog hop! You are welcome Kelly!! I thought the copper and gold went well! That copper makes my heart go pitter-patter. It’s so lovely. 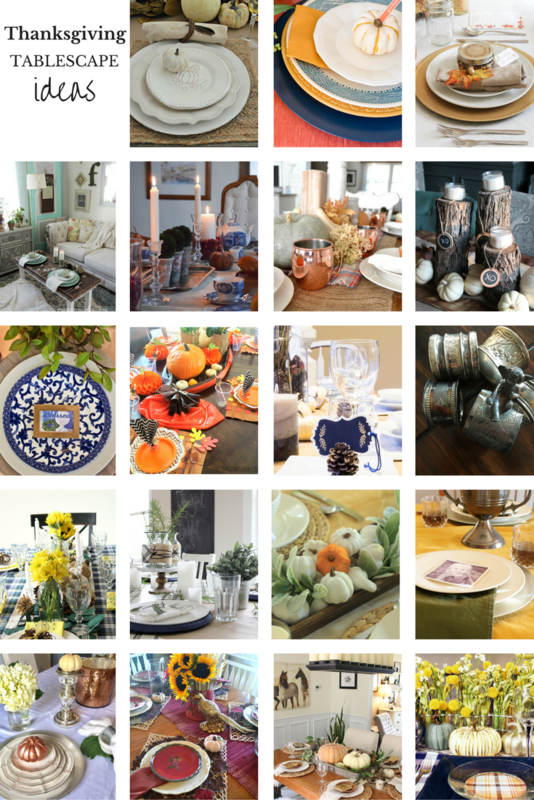 I hope you host for Thanksgiving just because it’s so lovely! Ha ha Mary!! Thanks – the copper was such a fun addition! Your tablescape is beautiful. Love the copper and especially the Thanksgiving Prayer! So fun hopping with you! I love them both too. Thought the prayer was a great way to show what it’s all about. Fun hopping with you, too! I love the little mason jar favors. Your decor always feels so warm and I love that about it! Beautiful tablescape & fun hopping with you! Happy Thanksgiving! such a beautiful tablescape!! I love the gold and copper accents. It’s glam and chic at the same time. Thank you Sarah! It’s the look I was going for!! ummmmm gold chargers at the dollar tree?!! OKAY! I’ve never hosted thanksgiving and we currently don’t have a dining room table sooooo yah. Someday! Looks great with the gold and copper! So warm! Yes, the Dollar Tree, lol!! They seem to have them every year. I love stocking up with them. Thanks!! Ha ha,, those little jars of candies are tempting. I had to keep them away from the kids while I was setting creating the table!! Ahhh thanks Melissa! It was so much fun putting it together – so glad it turned out well. 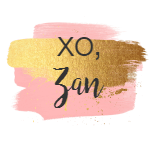 I love your tablescape, Zan! I hope you and your family will have a wonderful Thanksgiving! Dollar Tree for the win! 😉 I love all the varying heights you used for the items you placed on the table. LOL! Yes, Dollar Tree is awesome!! Thanks Shani! !